so glad that I found your blog! Thank you so much for sharing all of your patterns. Would be nice if you added a Pinterest button. So many would love to follow you there. Thanks for the suggestion. We have that on our list of improvements. I am so glad to have found your blog. I started knitting a few months ago and your blog is perfect for feeding my insatiable addiction. Just finished knitting the wrapped stitches baby hat and I love it and now I’m going to start on the chemo hats. All your instructions are clear and easy to follow. Thank you so much for your generosity. Thank you so much for the patterns. My daughter-in-law’s mother is fighting cancer right now and these will be great for her during this terrible time. A little comfort may help in some way. The easiest way to modify it for babies is to use DK weight yarn and size 6 (4mm) needles. Then the 85 stitch cast on will make a 15.5″ circumference hat. A 71 stitch cast on will make a 13″ circumference hat. How might I modify your patterns to use a lighter weight yarn with a size six needle? I am inspired with your simple creativity. You keep your instructions very simple. The end product is very unique. I’m so sorry it has taken me so long to reply. Just cast on 113 and proceed with the pattern as written. 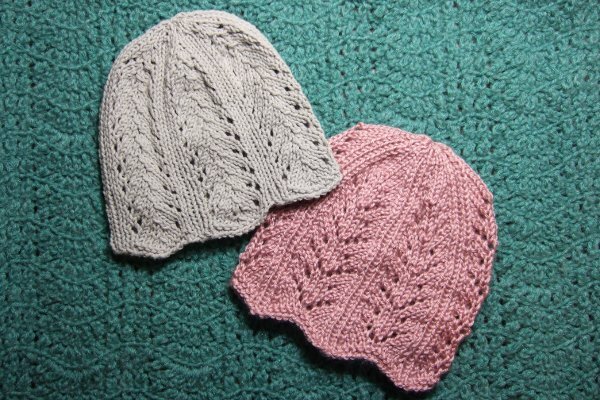 I want to make the chemo hats using four needles. I have U.K. double knitting wool. Your patterns call for 5mm needles. Will I have to make any adjustments, or is D.K. the equivalent of worsted weight wool. Thank you for always getting back to me! Correct. The UK double knit is the equivalent of the US worsted. Hi! Love all of your patterns. For this hat my head is 22″ and your pattern says a medium is 20″. I have the exact gauge and size needles to make this hat but do not know how to make it a tad larger for my head? I actually think with stretch this is going to be the correct size. You actually want a beanie style hat to be an inch or two more snug than the head size, otherwise it will be loose and not stay on. Thank you so much for these lovely patterns. I will be knitting some hats for myself as I am having chemo treatment for breast cancer and my hair is starting to thin quite quickly now. I love knitting and will be knitting more to donate to my local hospital as well as my treatment hospital for other people to have a lovely hat at such a stressful time in their lives. Bless you and all the wonderful posters who are knitting to help. thank you — I am going to try doing this. I am teaching myself knitting, I do know how to crochet, but I haven’t done this in a LONG time. I taught my Mom how to crochet and she was doing all the baby things for the families. Crocheting now makes my hand hurt so I have stopped crocheting and miss working with yarn. I want to make some chemo caps to give to the hospital. Thank you for showing how to modify this hat for babies above. My question is: For baby hats, what should the height of the hat be before beginning to shape the crown? Thank you so much! I’ve admired your page for a long time, and this is the first pattern of yours that I’ve tried! Thank you for these patterns. I made 3 of them and gave them to ladies who are battling lymphoma and they liked them. The patterns are easy to follow and turned out beautifully. I plan on knitting some more. Hi! I’ve been working on the Feather Lace pattern, and I can’t get the crown pattern to work. Is there a correction on the pattern that I’m not seeing anywhere? Something is missing. Please help me to figure this out. I love what I’ve done so far, and would like to finish it. Thank you. No corrections. Give me more details on what is off. One thing to be aware of is there are some decrease 3-to-1 stitches in the crown such as sssk and k3tog. I am anxious to give these patterns a try. I was looking for a cap that could be used in warmer weather. We have hot humid summers in Alabama. Thank you.